Little Women: A Story For Girls by Louisa May Alcott is an illustrated novel that tells the story of the maturation of four young sisters into womanhood, intended for young adult females living in Edwardian society. This particular edition of the novel was published in 1912 in London, England, by The Religious Tract Society, a Christian publisher which specialized in publishing children’s books and magazines. This edition of the novel features illustrations by Harold Copping, along with a preface by editor Flora Klickmann. The critical approach of this exhibit will examine how the novel was used as a pedagogical tool to implement moral values and gender norms for young women growing up in Edwardian society in 1912 in London. Little Women: A Story For Girls exemplifies how femininity was presented to young women during the time of the Civil War, along with how Christian moral values were promoted through children’s literature. Additionally, by incorporating the Civil War as a situation of adversity, Alcott creates a sense of empowerment for young women by promoting more independent roles (although they were confined to the passive roles in the domestic space). Fig. 1. The novel, bound in hardcover in white cloth with gilt edging on the pages. Image taken by Tanya Tan. 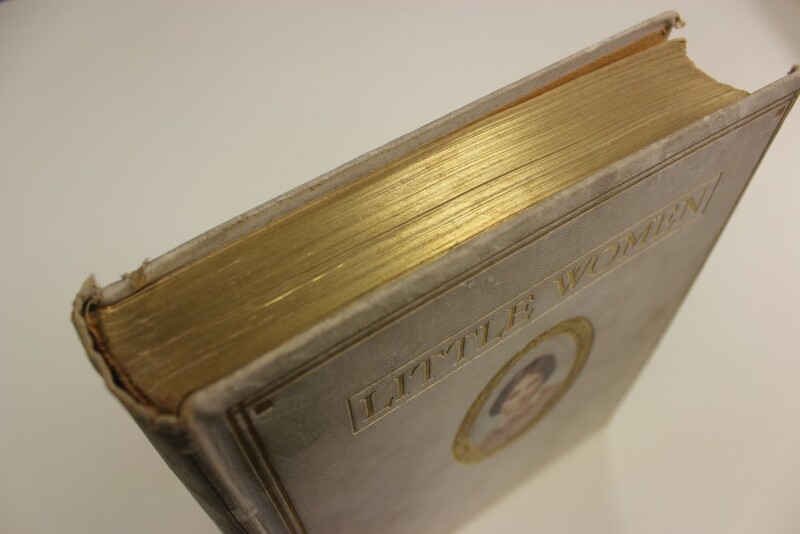 This edition of Little Women gives attention to aesthetic detail, as this novel was marketed as gifts to be given to young, upper middle class Edwardian women, often given at Christmastime. This aesthetic aspect is highlighted in this edition as it is a novel bound in hardcover in white cloth (Fig.1) , and is published in a larger size compared to most illustrated novels at the time (approximately 7×9 inches). Fig. 2. 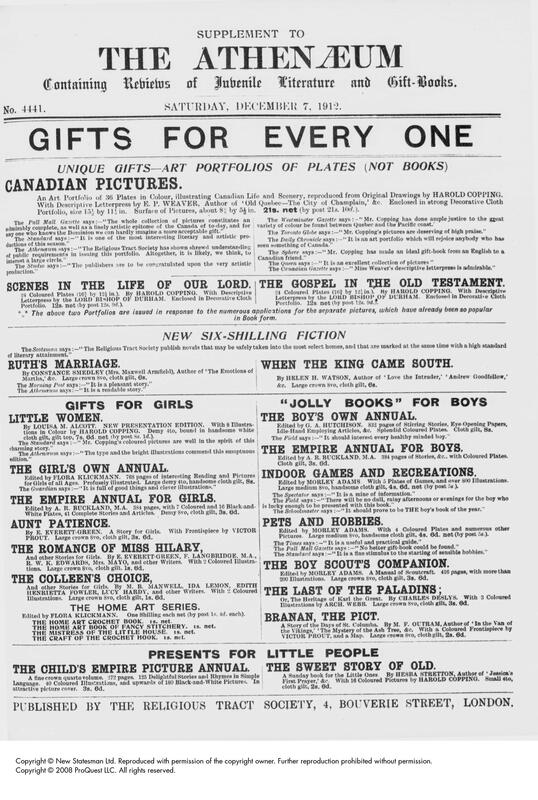 An advertisement for the novel published by The Religious Tract Society in 1912. Image taken from ProQuest. The luxurious aspect of the novel is further visible as it bears gold gilt edging lining the top portion of the pages of the novel (Fig.1), along with a tissue paper separator to protect the illustrations. As well, this novel was also marketed as a luxury item, as it was sold for a higher price than most children’s novels, evident in the advertisement for this specific edition of the novel (Fig.2), published in 1912 in the Atheneum, a well-respected journal at the time (The Religious Tract Society). Fig. 3. The spine of the novel, bearing an illustration in colour as well as gold font. Image taken by Tanya Tan. Furthermore, the spine of the book also bears an illustration of a young woman, along with gold font (Fig. 3). In this way, the pale white colour that the novel was originally intended when published, paired with the gold gilt edging, symbolize an association with purity and naivety (similar to the colours that are used to publish luxury Bibles at the time). Since the publisher of the novel was Christian, the outer appearance of the novel was meant to symbolize the purity that young females are expected to display and uphold in Edwardian society. Additionally, an illustration of a portrait of a young lady is displayed in a round gold frame on the front cover of the novel. This portrait depicts this young female with downcast eyes, which further alludes to the idea of preserving a young woman’s purity and obedience through this novel. As well, featuring a life-like portrait on the cover of the novel symbolizes how The Religious Tract Society wanted to frame this image as an ideal portrait of womanhood, depicting a female who was chaste and obedient, and one that Edwardian young women should aspire to emulate. Fig.4. One of eight water-colour illustrations by Copping, featured in the novel. Image taken by Tanya Tan. Throughout the novel, the text is accompanied with eight coloured plates reproduced from original watercolour drawings by Harold Copping, which are printed on white paper and display captions from the novel. These illustrations by Copping depict realistic, life-like images of the characters, which provide for a more relatable aspect for the readers (Fig.4). Fig. 5. The Girl’s Own & Woman’s Magazine, a publication intended for young Edwardian women, also published by The Religious Tract Society and edited by Flora Klickmann. Image taken from Antique Pattern Library. The publisher of this edition of the novel, The Religious Tract Society, founded in 1799 (Delaney 28), was a Christian publisher in Britain, specializing in children’s literature with a Christian context, often with underlying morals of obedience to their stories. For example, a novel entitled, Divine and Moral Stories For Children by Isaac Watts (Watts) outlines moral rules to abide by for children. 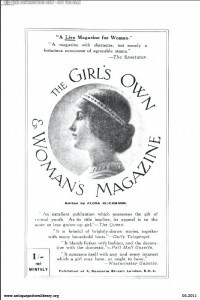 The Religious Tract Society was also the publisher of The Girl’s Own and Women’s Magazine (Fig.5), which later became titled The Girls Own Paper. As well, The Religious Tract Society also published a corresponding magazine for boys, entitled The Boy’s Own Paper (St. Andrews Special Collections). As well, The Girls Own Paper was considered as a source that constructed womanhood in Edwardian society (Delaney 29) as content themes focused on domesticating women and confining them to household chores. Additionally, The Girls Own Paper was “instrumental in establishing the girls’ story, celebrating family and home as a genre” (Simons 145). For example, The Girls Own Paper featured articles based in the domestic space, such as how to crochet and prepare meals along with being obedient and kind, while The Boys Own Paper published articles related to adventure and outdoor exploration themes. This is instrumental in revealing how Edwardian society enforced gender expectations separately for girlhood and boyhood through children’s literature (Simons 143). As well, the illustrator, Harold Copping, also illustrated other children’s novels at the time, such as A Night In the Woods by James Weston (Weston) along with several other Christian children’s novels published by The Religious Tract Society, such as Scenes In The Life Of Our Lord and The Gospel In The Old Testament, two publications also advertised in the Atheneum (The Religious Tract Society). Copping was largely known for his life-like, Biblical illustrations. For example, his illustrations were featured in The Women Of The Bible, which was also published by The Religious Tract Society, and depict portraits of feminine characters from the Bible (The Spectator). Fig. 6. 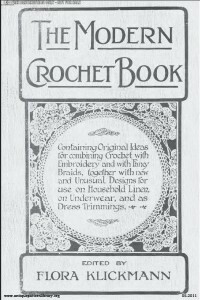 A sample of Flora Klickmann’s published works for young women, entitled, The Modern Crochet Book. Image taken from Antique Pattern Library. 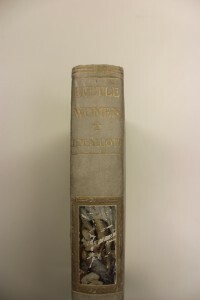 Additionally, the editor of this edition of the novel is Flora Klickmann, an English writer and editor of books for young women, which often featured domesticated themes such as sewing and crocheting (Fig. 6). Klickmann also served as editor of The Girl’s Own Paper, also published by The Religious Tract Society. Flora Klickmann outlines in the preface that this novel is a positive teaching tool for young women by portraying them in a domestic space along with stressing the importance of family life. For example, Klickmann states in the preface of the novel that “the secret of the book’s longevity lies in the fact that it deals with some of the greatest of life’s fundamentals- the everyday happenings in a normal home, the love of parents and children, the strength of home ties, the ‘give and take’ of family life, and all the hundred-and-one things that crowd childhood’s days” (Klickmann 3). In this way, it is evident that Klickmann promotes this idea that young women should be domesticated, obedient and docile, and that happenings in the home, as portrayed in the novel, were fundamental to the development of young women in particular. As well, along with morals and obedience to their parents, Edwardian children were being conditioned by adults using children’s literature as a pedagogy tool, teaching them to behave a certain way based on their gender. Children were also being taught through children’s literature what was acceptable in society in terms of behaving according to gender roles. For example, females were taught to be domesticated and aspire to marriage, while young males were taught to be adventurous and valiant. This is especially evident in The Girls Own Paper and The Boys Own Paper, as they were marketed to separate audiences based on gender (St. Andrews Special Collections). The reception of this edition of this novel was also received positively by critics at the time. For example, in The Religious Tract Society’s advertisement in The Atheneum (Fig.2), a statement from a review by The Atheneum is featured, stating “the type and brilliant illustrations commend this sumptuous edition” (The Religious Tract Society). A statement by The Standard commending Copping’s illustrations and the novel’s message is also featured in this advertisement to further promote this edition of the novel as a positive novel to give to young women. Further, in terms of the reception of this edition of the novel, The Religious Tract Society aimed to garner a similar response to the previous edition of the novel, which is expressed in the review from Harper’s New Monthly Magazine, published n 1869. This review expresses that the novel was received positively, and seen as a novel suitable not only for young women, but for adults as well. As well, this review shows how the novel was regarded as having a positive underlying message about girls growing up and coming of age (“A Review of Little Women”). Additionally, a similar reception of the novel is evident I a review published in The Nation in 1868, expressing that the novel was an agreeable story for young girls as healthy women, and paints a portrait of what a young lady should look like in Edwardian society (A Review Of Little Women: or, Meg, Jo, Beth and Amy”). The Religious Tract Society aspired for a similar reception of their edition in 1912, which was promoted to frame the story in a Christian light, and as a novel which promoted positive role models for young women. 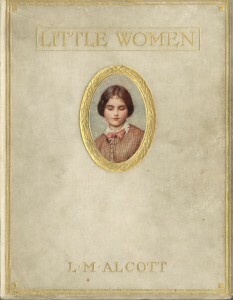 This edition of Little Women: A Story For Girls by Lousia May Alcott was a novel used as a pedagogy tool to instill moral values in young women as well as present expected behavior of gender roles to children. In the novel, young women are presented as domesticated, as demonstrated by the March sisters, who all contribute to the well being of their household by completing chores and being obedient young females. Furthermore, it is evident that the story of Little Women: A Story For Girls is one that was viewed as setting a positive and proper example of how young women should behave in Edwardian society. In the novel, Alcott depicts four female characters who not only abide by society’s expectations by being obedient and respectful, and also demonstrate Christian moral values of selflessness and kindness. Additionally, as the March sisters mature into young ladies, their mother, Marmee, teaches them certain Christian values such as being compassionate and generous. For example, during Christmastime, Marmee explains that they will be selflessly donating their Christmas breakfast to their neighbouring family who are less fortunate than they are. In this way, by instilling these moral values in the novel, it is used as a pedagogical tool in order to teach children through literature of how a young lady should act in society and what moral values should be instilled upon her. Additionally, as The Religious Tract Society was a publisher of Christian books for children, it is evident that the preface by Flora Klickmann frames the story with a Christian moral perspective. Klickmann expresses in the preface that this is an agreeable story for all ages because of the Christian values it promotes through its story. 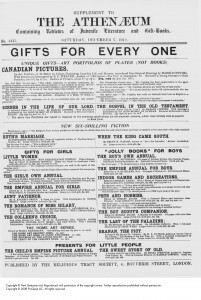 It is therefore evident that by adding this preface by Klickmann, The Religious Tract Society believes that Little Women: A Story For Girls is a beneficial pedagogical tool to teach young women Christian values such as chastity, obedience, charity and kindness, as well as promoting gender role expectations for young females living in Edwardian society in England. Further, incorporating the Civil War into the novel was instrumental in creating a backdrop for Alcott to promote strong and more independent young females. Although the Civil War took place in America, the hardships of war are presented to Edwardian young women living in England as a teaching tool about the importance of family life despite being placed in a situation of adversity. Alcott uses the Civil War in order to promote independence for young women, as they were left at the home front while the men were away at war. Alcott promotes this sense of independence in the character of Jo, the oldest March sister, who demonstrates a strong sense of responsibility to provide for her family. With the incorporation of the Civil War into the novel, Alcott is able to remove the role of the father being present in the household, and therefore creates a stronger sense of independence for young females to take on roles of responsibility at the home front. For example, young women were most often associated with the domestic space, and although older women (such as their mother, Marmee) were employed in workplaces such as factories, younger women were often confined to household chores and the keeping of the domestic space. This is an example of how the incorporation of the Civil War enriches the storyline of the novel, since with the Marches’ father away at war, the female characters in the novel were given more roles of responsibility. Fig.7. An illustration by Copping depicting the independent character of Jo, cutting her hair in order to provide for her family. Image taken by Tanya Tan. 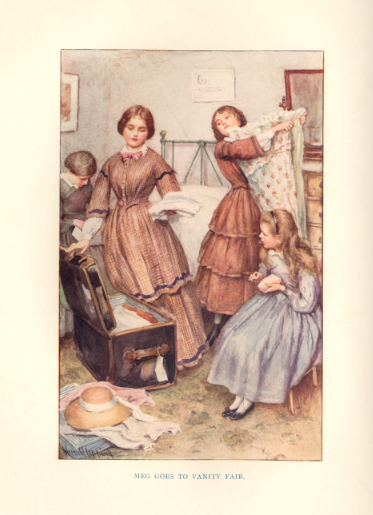 In Little Women: A Story For Girls, Alcott empowers young women to strive for independence within the constraints of their expected gender roles. For example, Alcott illustrates a sense of empowerment with the character of Jo, as she actively finds independence through writing (Simons 147). Through writing, Jo is able to escape the mundaneness of day-to-day life and being confined to the domestic space with her sisters while their father is away at war and their mother constantly working to provide for their family. In this way, the novel teaches young women the importance of being independent, as although the character of Jo was confined to the household performing domestic tasks with her sisters, she also found other ways to be independent and to earn income for her family. 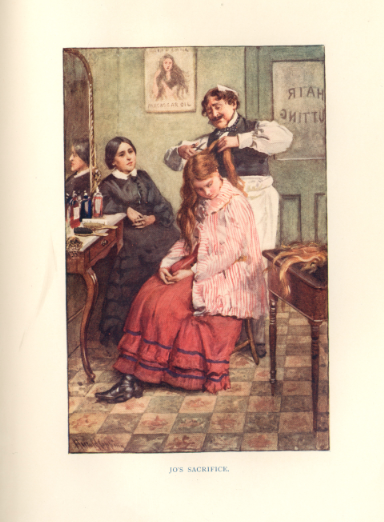 For example, Jo was able to earn additional income for her family through her writing of short stories, along with cutting and selling her hair (Fig.7). In this way, through the character of Jo, who “became an emblem of independent girlhood for generations of readers,” (Simons 147) Alcott finds a way to create a sense of empowerment for young women without overstepping the boundaries and expectations that were placed on young women during that time period by Edwardian society. In this way, it is evident that Little Women: A Story For Girls was used as a pedagogical tool to allow adults to condition children on what was acceptable behavior for young women living in Edwardian society in England. As well, the novel’s underlying Christian values were seen as acceptable in demonstrating positive role models to create good women for the future. Little Women is also a critique of the society during 1912, as it is evident that young women were viewed a certain way, often confined to domestic roles at the home front while the males were away at war. In addition to outlining the ideal portrait of a young lady in Edwardian society, Alcott also found a way to promote a sense of empowerment for young females within the gender norm constraints of 19th century society by creating independent young female characters. “A Review Of Little Women.” Rev. of Little Women, by Louisa May Alcott. Harper’s New Monthly Magazine August 1869: 455-456. Literature Resource Center. Web. 20 Feb 2014. “A Review Of Little Women; or, Meg, Jo, Beth and Amy.” Rev. of Little Women, by Louisa May Alcott. The Nation October 1868: 335. Literature Resource Center. Web. 20 Feb. 2014. Curnow, Chris. Project Gutenberg’s The Religious Tract Society Catalogue. Project Gutenberg, n.d. Web. 1 March 2014. Delaney, Lesley. “Little Women, Good Wives: Victorian Constructions of Womanhood in the Girl’s Own Annual 1927.” Children’s Literature in Education 34.1. (2003): 29-45. ProQuest. Web. 2 March 2014. “Harold Copping’s Bible Pictures.” 1927. The Spectator Archive. Web. 21 Feb. 2014. Klickmann, Flora. Preface. Little Women: A Story For Girls. By Alcott. London: England, 1912. 3-4. Print. Simons, Judy. “Gender Roles in Children’s Fiction.” The Cambridge Companion to Children’s Literature. Cambridge: Cambridge University Press, 2009. 143-158. JSTOR. Web. 28 Feb. 2014. The Religious Tract Society. Advertisement. The Athenaeum. 4441 (1912): 705. ProQuest. Web. 28 Feb. 2014. Watts, Isaac. Divine and Moral Songs For Children. London: The Religious Tract Society, 1893. University of Florida Digital Collections. Web. 27 Feb. 2014. Weston, James. A Night In The Woods. London: Sampson Low, Marston And Company, 1894. University of Florida Digital Collections. Web. 27 Feb. 2014.